Archives : DEEPAWALI SPECIAL - YEAR OF CORRECTION - 21/10/2011. THE YEAR OF CORRECTION - 21/10/2011. First of all let me wish all my readers a very Happy Deepawali and a Prosperous New Year. May you all have a successful trading year ahead. Last Deepawali the indices were at its high and looked on course to take out its previous high of Sensex 21308 and Nifty 6357. But that was not to be and Sensex fell after making a high of 21206 and Nifty 6338 during Deepawali 2010. One year has passed and the markets have spent the entire year correcting the entire rise. The most pertinent question on everyone’s lips is whether the Bull market is over? The answer is an emphatic No. We are still in a long term Bull Market setup. The entire year has been spent to correct the previous rise and the indices have taken support at the 38.2% Fibonacci Retracement level. The more relevant question is what now? Let us look at various factors which will affect the market next year. Global markets have been in turmoil with European markets exhibiting signs of near collapse as the fear of sovereign default increases. There is no magic wand to solve this debt crisis in short to medium term. One needs to be realistic to understand that it will be a long wait for these markets to reclaim some of its past glory. It is going to be a dark winter for the Western markets. 2. LOCAL FACTORS : GROWTH v/s INFLATION. Amongst the local factors the most important are Growth and Inflation. The demon of Inflation is showing no signs of abetting as it marches into double digit. RBI has been overly active in its attempt to control Inflation but the results are no where to show. What the RBI has managed to do is to dampen Growth as it has subsided to around 4 to 5%. The interest rate tightening cycle seems to have reached the higher end of its range and there seems little room for the RBI to increase the interest rates further. This cycle may turn around sooner than later and we may see interest rates decline once there is even a hint of inflation showing signs of slowing down. 3. SCAMS & ANNA FACTOR. The Government has been on the back-foot throughout last year as Scams have rocked the Congress continuously. Arrests of several top leaders and supporters of Congress have affected the morale of the government. Not to mention the anti-corruption drive via the LokPaL Bill undertaken by Anna Hazare and his crusaders of Anti-Corruption movement. The market has been ruthlessly subjected to the above factors for the past year and even though there is no sign of any positive ending in sight; one can safely say that the worst for the market may be behind us. The going may not become Bullish but the intensity of the Bearishness will be much lower this year. On the weekly charts, both Sensex and Nifty have completed Bearish pattern formations viz. Bearish Head and Shoulders and Bearish Descending Triangle. The target for Bearish Head and Shoulders pattern falls at 14651-13928 for the Sensex and 4357-4143 for the Nifty. 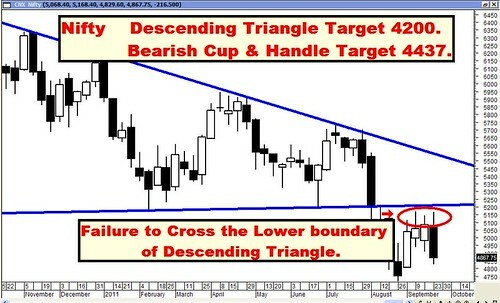 The target for Bearish Descending Triangle falls at Sensex 13952 and Nifty 4200. A weekly close above Sensex 19131 and Nifty 5740 will be the first signal that the above Bearish patterns have failed. Till then every rise will be met with strong Selling pressure by the Bears. Retracement Analysis clearly suggests that we are in still in a long term Bull market and we are experiencing a price as well as time wise correction. The market is correcting the entire rise from 7697 to 21108 for the Sensex and 2252 to 6338 for the Nifty and currently the market seems to have taken support at the 38.2% level which is at Sensex 15985 and Nifty 4777. Sensex has made an intermediate bottom at 15745 and Nifty at 4720. Only if these recent intermediate lows are breached, can one expect the indices to roll down further upto the level of 50% and 61.8% and i.e. 14402-12820 for the Sensex and 4295-3813 for the Nifty. Currently both the indices are taking support the Gann Fan line. 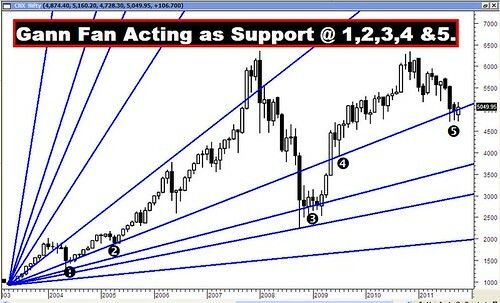 For Nifty, if the monthly closing is below 5000, then the Gann Fan Support line will be breached and then the Nifty will head lower to find the next Gann Fan Support line and that will be at 3719. From the analysis shown above we can conclude that only a close above Sensex 19131 and Nifty above 5740 will propel a Bull move as these are the levels where the Bearish patterns will fail. Also these levels coincide with the 61.8% retracement of the entire fall witnessed during last year. So any closing above these levels will propel the Sensex and Nifty towards the previous high i.e. Sensex 21206 and Nifty 6357; and then much beyond. Keep your fingers crossed while you pray for the Bulls. For the year ahead, Sensex will face Resistance at 19131-21206-23461 and Support will be at 15106-13219-11621. For the Year ahead, Nifty will face Resistance at 5740-6357-7046 and Support will be at 4538-3918-3514. RANGE TRADING CONTINUES – 21/10/2011. 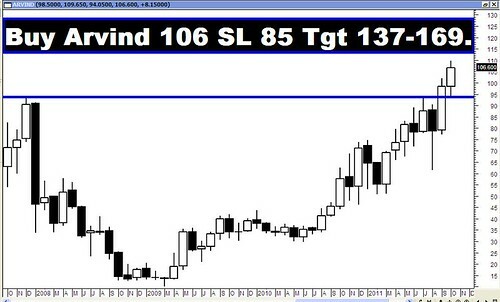 All hopes are now pinned on the Deepawali week to provide the much required breakout. Range bound market has been the order of the day and it has been three months that the traders have been subjected to Range trading. Traders have a preference for a trending market and dread trading in a range bound market because of the whipsaws they are likely to suffer. The market is moving in a broad, well defined Nifty trading range of 4720 – 5170 since August. Interestingly the top and bottom of the Trading range has been tested four times without getting breached. Currently it is in a smaller trading range of 5011 – 5160, which is near the top end of the bigger trading range. The market has been in corrective mode since last Deepawali and the bulls are now hoping that the tide will turn in their favour, starting with a bullish breakout of the trading range this Deepawali. The Sensex opened the week at 17176, made a high of 17188, a low of 16669 and closed the week at 16785. The Sensex lost 297 points on a weekly basis. Similarly Nifty opened the week at 5156, made a high of 5160, a low of 5011 and closed the week at 5049. The Nifty too closed with a weekly loss of 83 points. Both Sensex and Nifty have formed a Black body candle on the daily charts. This is after a small white body (almost a neutral formation) was formed on Thursday. Fridays black body formation on the daily charts should not be much of a concern as the Nifty has taken support at 5011 mark and now even the medium and short term moving averages are supporting that level. On the weekly charts we have an Opening Black Body Marubuzo which fails short to being confirmed as Belt hold because of the lower shadow. It is not even a Dark Cloud Cover as the Black body does not close below the midpoint of the previous week’s white candle. It is almost a bullish counterpart of Thrusting pattern and hence one can expect some upmove in the coming week. The small bearishness will be taken out, when the Nifty closes above the high of this weeks black body candle and i.e. 5160. Thus any close above 5160-5170 will lead to a strong upward move. Both the indices are moving within a well defined trading range i.e. between Sensex 15745 to 17211 and Nifty 4720 to 5170. The top and bottom end of the trading range has been tested four times without getting breached. This trading range was formed after Nifty formed a bearish breakaway gap between 5323 – 5229. This Bearish gap will act as a strong resistance once the current Nifty top of 5170 is taken out. In case the indices take out the upper end of the trading range i.e. Sensex 17211 and Nifty 5170, then it is likely to approach a strong resistance zone between Sensex 17664-17845 and Nifty 5323-5360. This resistance zone is formed by the convergence of the 61.8% of the immediate fall, 50% of the intermediate fall and 38.2% of the entire fall. This is further strengthened by the presence of Bearish Falling gap. Thus we have strong Resistance Zone between Sensex 17664-17845 and Nifty 5323-5360. Both Sensex and Nifty have continued to remain above the short term average of 20dma (Sensex – 16548 and Nifty – 4977) and medium term average of 50dma (Sensex – 16630 and Nifty – 4997). As a result the short and medium term trends remain up. But the market is still well below the long term average of 200dma (Sensex – 18075 and Nifty – 5425). As a result the long term trend continues to remain down. From a broader perspective the market is correcting the entire rise from 7697 to 21108 for the Sensex and 2252 to 6338 for the Nifty. If the market breaches and closes below the intermediate low of 15765 for the Sensex and 4720 for the Nifty, then the market is likely to move towards the 50% and 61.8% levels of the entire fall for the Sensex and Nifty. Those levels are 14402-12820 for the Sensex and 4295-3813 for the Nifty. Both Sensex and Nifty had given a weekly Bearish Head & Shoulders breakout and the target for that falls at 14651-13928 for the Sensex and 4357-4143 for the Nifty. After that the weekly Bearish Descending Triangle got completed and the target for that falls at Sensex 13952 and Nifty 4200. On a smaller degree, there is a Bearish Cup and Handle formation and the target for that falls at 14789 for the Sensex and 4437 for the Nifty. MACD and ROC both are in Buy mode and in positive territory. RSI remains above the centerline and is at 51 and hence Buy signal continues. Stochastic Oscillator is overbought as %K is at 84. ADX is quite low at 15 suggesting that the index is almost trendless or in sideways mode. Directional Indicators continue in Buy mode as +DI is above -DI. OBV is moving lower and continues with its lower top and lower bottom formation and hence Sell signal continues. Money Flow is at 61, continues with its Buy signal. Nifty OI PCR is high at 1.52. 4800 strike is showing strong Put buildup and highest Call writing is seen at 5200 strike price. Thus Nifty can be expected to find Support around 4800 and will find Resistance around 5200. Trendline Resistance for the Sensex is at 17187. Trendline Support for the Sensex is at 15974. 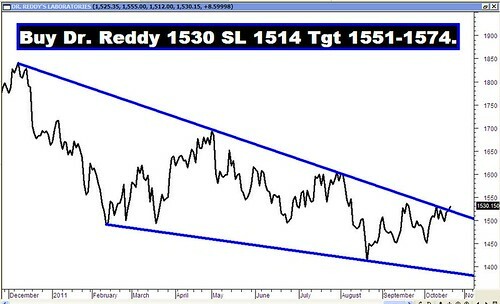 Trendline Resistance for the Nifty is at 5157. Trendline Support for the Nifty will be at 4783. For the week ahead, Sensex will find Support at 16433-16096-15745 and will find Resistance at 17122-17469-17790. 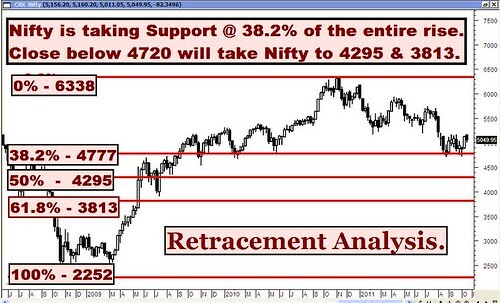 For the week ahead, Nifty will find Support at 4942-4828-4720 and will find Resistance at 5143-5232-5328.